For pump system operators, smooth system operation is crucial – especially when the technical or legal framework conditions change. Over the course of time, it is not unusual that pump systems will need to be modernised through upgrades or modifications. KSB offers individual support to every customer with bespoke solutions – quick, professional and cost-effective. KSB analyses the complete pump system, identifies opportunities for system optimisation and implements them in a targeted and professional manner. The advantages: increased energy efficiency, longer service lives and optimum adjustment of pumping equipment to changes in operating data. KSB offers checks of well pumps, too. One third of these pumps operate at an overall efficiency of less than 40 percent. Ask us for well pump measurement. Good to know: KSB optimises and modernises existing pumps and valves, whatever the manufacturer or make. The starting point for all system optimisations by KSB is a comprehensive system analysis of the pump installation. A data logger simultaneously records process and vibration values at the site. This enables us to identify the pump’s current load profile and compare it with the specifications. We can then recommend action to maximise energy efficiency and ensure that your pumps and systems run economically. A new pump isn’t always necessary. Retrofit solutions from KSB: the alternative to buying a new product These retrofit solutions for upgrading systems optimally combine modern technology and professional service. 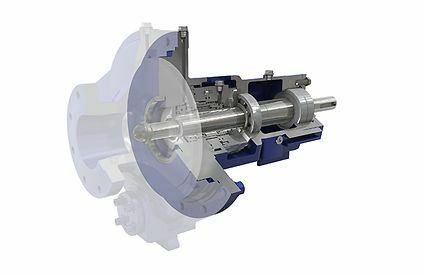 KSB optimises pumps and valves by performing hydraulic, mechanical or materials upgrades. The goals: to reduce maintenance and energy costs and increase the system’s service life and availability. Pumps that are not optimally matched to the system consume too much energy. Thanks to the SES System Efficiency Service from KSB this doesn’t have to be the case. Comprehensive system analyses identify the potential savings which can be tapped within an installation. Your system may be working reliably. But is it truly efficient? And how can we increase its efficiency? To find the answer KSB offers you a comprehensive pump check. Retrofitting is an excellent alternative to buying a new product and can be performed on pumps regardless of their intended use. It is equally suitable for industrial, water supply and waste water disposal applications as well as for the power supply industry. The advantages of a retrofit solution are the combination of state-of-the-art technology and expert service.